Our Westfalia Vanagon waits patiently for us climb in and drive back to Atlanta. We are way outside of Atlanta, in Villa Rica near the Alabama-Georgia border. We are in the library. 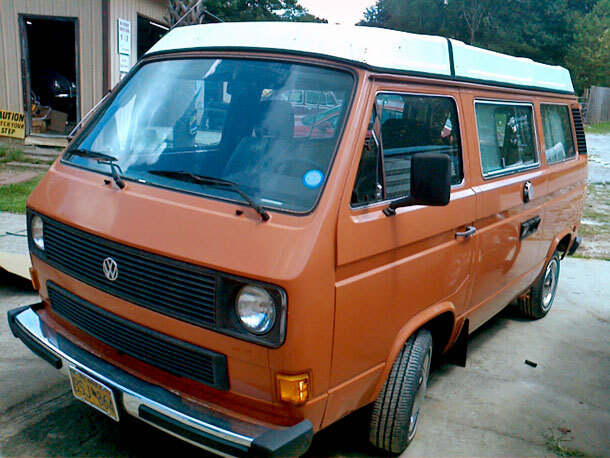 We have just looked at and driven a 1982 Volkswagon Vanagon a few miles up the road. We sit in the air-conditioning and review our options. We want to sell our Civic and buy a camper van. We carry tools, clothes, and kitchen supplies when we travel on land. Itâ€™s a lot of trouble to unload/load everywhere we stop. And even though we usually have a full summer schedule of house-sitting, once in a while there are gaps. It would be nice to be able to camp then. Also, we would like to travel more. Camping is a lot cheaper than staying in hotels. So we have been searching on-line and reading about campers for months. Very early in our search Duwan said she likes the look and features of the VW campers. We decided that a pop-up version was necessary for our needs. And, of course, we donâ€™t want to spend a lot of money. If possible, I wanted to run our â€˜newâ€™ vehicle on Waste Vegetable Oil (WVO). I learned that Volkswagon marketed a diesel Westfalia camper van in the early 80s. It had a short run here. The small 1600 CC engine was not fast enough for Americans. Most people who bought these upgraded to a 1.9 L engine or just put a gas engine in. We would need a diesel if we wanted to install a WVO kit. When in FL we looked at some Westies in person. We came back to Georgia knowing there was a three week gap in our house sitting schedule. As the gap neared our online search became more earnest. Our Craigslist, TheSamba, and CarGurus searches yielded about 50 Vanagons with all our requirements for sale. About half of these were in California. We might need that whole three weeks to go find and bring a Westy back. Of these, only four were diesels. One, in Oregon, already had a WVO conversion kit installed. One was in Virginia and another was in California. These all had the small 1.6 L engines. One, however, was here in Georgia just an hour away. So here we sit, trying to decide whether to buy it. This has been nothing like any of my new car purchase experiences. The van is out in the country, down a dirt road, in the yard of a shop that mostly sells and ships old VW parts. When we arrived I slipped some cardboard under the engine. We looked the van over. It was in pretty good condition. Most everything was intact, even after 32 years. After a battery recharge, the van cranked right up. It was loud, but ran smoothly. We got ready for a test drive. There is no AC, but it has those small triangular windows that direct air straight toward you. Mine opened easily, but Duwanâ€™s window was a little stiff. She pushed harder and the window exploded apart, throwing glass in all directions. The guys brought out a shop-vac and cleaned up the glass. They called, found a window and said they could install it if we wanted the van. Meanwhile, I checked the cardboard I had put under the engine. Yep. Oil drops. We took the van for a spin. Itâ€™s SLOW. It accelerates slowly, and I doubt it has ever been over 65 MPH unless careening down a mountainside. Thatâ€™s OK. We arenâ€™t in a hurry. Back at the shop I look closer at the oil leak. I donâ€™t think itâ€™s serious. Looks like a small seal near the oil filter. I tell them I would like to have a mechanic look at it. They donâ€™t want us to drive it off, but there is a VW mechanic nearby. Turns out he only works on models 1995 and above. So here we are in the library trying to decide whether to buy. They came down on the price because of the oil leak. We already know we will be doing a lot of work to whatever we purchase. We compare this deal to the other diesels. The only one significantly different is the WVO van in Oregon. Do we really want to drive there and drive two vehicles back? We call the shop and ask them to put in the replacement triangular window. We will come over and start the paperwork. I didn’t know they made a diesel. Best of luck! I say you can run that VW just like you did the Pearson. Now that I think about it, why not run the Pearson with the WVO? Good luck and keep your fans posted on progress.